Mice with Human Brains – Really! Locked in the depths of cavernous laboratories to ensure that no part of them can escape into “the food supply”, the chickens aren’t even considered to be animals; rather, they are living drugs. So, yes, the floodgates are open, and it’s full speed ahead to produce mice with human brains, pigs with human hearts, livers and whatever else, and chickens who are classified as drugs. 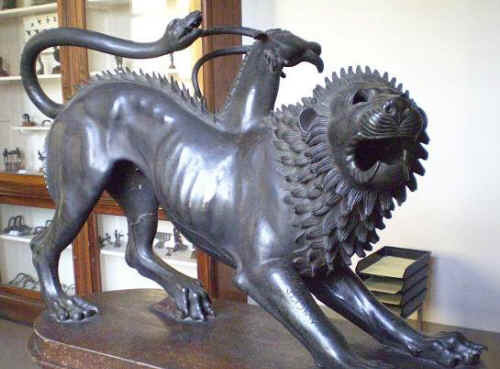 Those Ancient Greeks were on the right track after all: Horses with human heads, lions with snakes for tails, and the original Chimaera, who had the body of a goat with a lion’s head and a dragon’s rear end. But why settle for mythology when you can make your own real-life chimera in the lab, and lots of money at the same time?\Which brings us to this week’s quiz. Which of the following is a real quote from a medical researcher? Yes, folks, it’s all of the above, and even though the National Institutes of Health is trying to put the brakes on those floodgates, that doesn’t mean beans to intrepid vivisectors who dream of fame, fortune and a Nobel Prize. After all, if the government is leery about going pedal-to-the-metal on mice with human brains and pigs that can grow human hearts and livers for transplants, we can just bypass the government and get the money from big business. No, the FDA certainly can’t be accused of dragging its heels when it comes to creating new chimeras. It’s already green lights for “farmaceuticals” from genetically modified goats and salmon, and for transgenic rabbits who, in their new form, produce a drug to treat hereditary angioedema. But back to the quiz. So, who’s the hearty vivisectionist who said “We can make an animal without a heart”? That would be cardiologist Dr. Daniel Garry, who leads a chimera project at the University of Minnesota. It’s not that difficult: First you disable some of the DNA in a pig or sheep embryo, then you replace that with some stem cells from a human, and if all goes right, the human cells take over the job of forming the missing organ. So now you have a sheep or pig fetus with the heart of a human, which you can then “harvest” from the baby animal and transplant into a human patient. When the NIH stopped funding such research, citing concerns that those human cells could flower into neurons and reproductive tissue, its stance was underpinned by the specter of cross-species horrors: first, a non-human animal with human consciousness … second, the chance of a human embryo gestating inside another species. … Fusing human and animal cells to make human organs may be seen by some on the religious right as an affront to human dignity. Goldman’s team extracted immature glial cells from donated human fetuses. They injected them into mouse pups where they developed into astrocytes, a star-shaped type of glial cell. Within a year, the mouse glial cells had been completely usurped by the human interlopers. The 300,000 human cells each mouse received multiplied until they numbered 12 million, displacing the native cells. Astrocytes are vital for conscious thought, because they help to strengthen the connections between neurons, called synapses. Their tendrils are involved in coordinating the transmission of electrical signals across synapses. Human astrocytes are 10 to 20 times the size of mouse astrocytes and carry 100 times as many tendrils. This means they can coordinate all the neural signals in an area far more adeptly than mouse astrocytes can. “It’s like ramping up the power of your computer,” says Goldman. Yes, just imagine your brain being taken over by the neurons of another species. When is the brainy Dr. Goldman going to try it on himself? Meanwhile, as we humans drive hundreds of species of animals to extinction every week, the vivisectionist de-extinctionists are working to save the day by resurrecting wooly mammoths and dinosaurs. Maybe they’ll soon be growing tyrannosaurs with human heads. Ancient mythology becomes modern reality. What would the Ancient Greeks say about that?